As a reputable decking construction company in Portland OR we make it our mandate to only recommend the best decking products to our customers. This is why we have chosen to be an authorized dealer and installer of the Tufdek waterproof vinyl deck membranes. Tufdek waterproof deck coverings are some of the industry’s most sought after vinyl deck designs and have rightfully earned the title of the World’s strongest vinyl decking product. Here in Oregon, you truly need the strongest vinyl decking possible when you live in an area that gets an average of 154 days of rain (and 144 days of sun) each year. You need a strong vinyl decking product that is not only tough and waterproof but can also withstand the heat. And, with Tufdek’s optional Cool Step™ technology, you can even enjoy your deck on those hot sunny days. Our customers love the available vinyl decking colors and designs that Tufdek offers. We carry an extensive collection of designer vinyl decking suitable for patios, decks, rooftop patios, stairs, and even pool decks of all sizes. Among the most popular is the Tufdek wood plank vinyl available in a variety of finishes including Birch, Rustic, and Driftwood. For sundecks and patios that get direct sunlight, we recommend Tufdek’s Cool Step™ vinyl decking technology. Rather than absorbing the sunlight and making your deck surface too hot to walk on, the Cool Step technology reflects the heat, and protects the finish against harmful UV and infrared rays. In order to become an Authorized Tufdek Dealer and installer, our decking crew has completed the Tufdek training program to learn the proper methods for installing this outdoor waterproof vinyl flooring. Your decking crew will have years of training and field experience to create the 100% waterproof deck you’ve always wanted. And, every Tufdek vinyl decking installation also comes with a comprehensive warranty that covers both labor and materials. 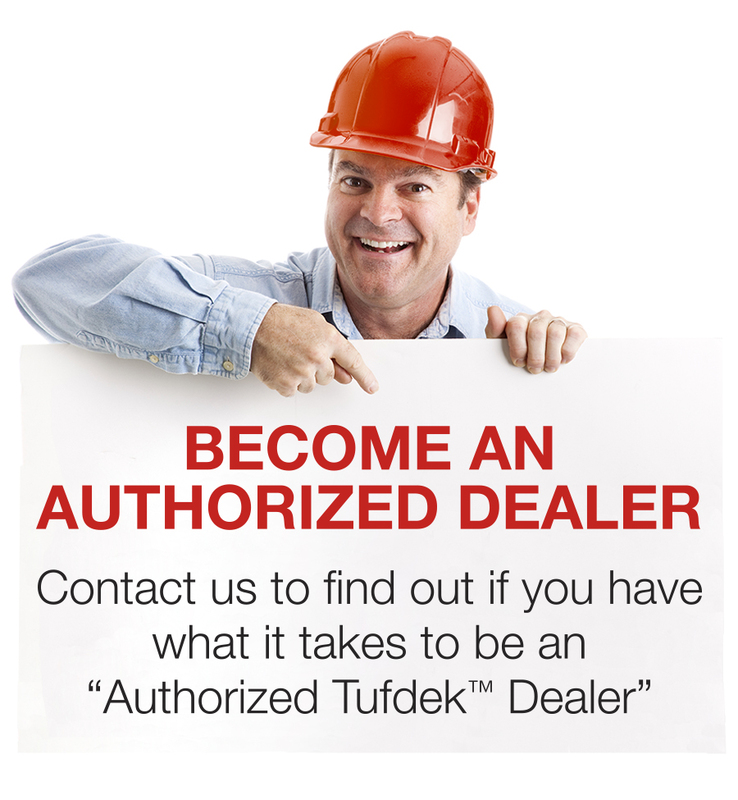 Interested in getting more information on how our authorized Tufdek™ vinyl decking installers in Portland can help you enjoy the long-term benefits of Tufdek waterproof decking products? Please call our Tufdek office toll free at 1-877-860-9333 or complete the following contact form below, and one of our Portland OR vinyl decking installers will be in touch with you shortly. We look forward to serving you!